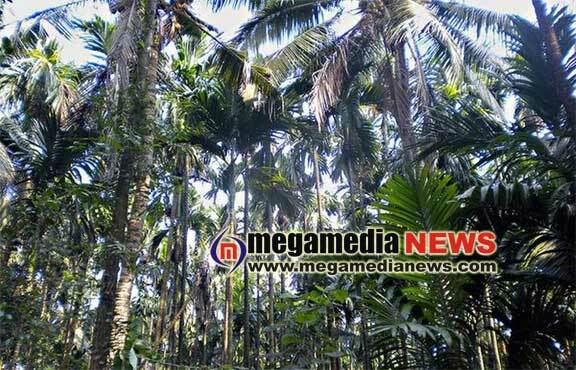 Mangaluru: Nearly 56,000 arecanut farmers in Dakshina Kannada have sought compensation from the government for loss of produce due to Kole Roga (fruit rot disease) which struck their plantations during this rainy season on a vast scale, after five years. According to Deputy Director, Department of Horticulture, Dakshina Kannada, H.R. Nayak, the disease has hit plantations spread over 33,000 hectares. The total compensation to applicants has been estimated at ₹ 60 crore as per the National Disaster Response Fund (NDRF) guidelines. It specifies ₹ 18,000 as compensation per hectare. The disease spread in June and July due to heavy and continuous rainfall. Some pockets on the foothills of the Western Ghats in Sullia and Belthangady taluks started receiving rainfall in May itself. Dakshina Kannada Additional Deputy Commissioner Kumar said that the compensation amount is ready for disbursement with the government. Now, the process of uploading data of applicants on the Parihara software of the government is under progress. Once it is done, the amount will be credited to the bank accounts of applicants. President of All India Areca Growers Association, Puttur, Manchi Srinivasa Achar said that the district has suffered an average 30 % crop loss due to the disease. In some individual cases, growers have lost crops to an extent of 80 %. Central Arecanut and Cocoa Marketing and Processing Cooperative Ltd. Managing Director M. Suresh Bhandary said that arecanut arrivals at the cooperative this season has come down after Deepavali, when compared to the last year. But it is not sure whether it is related to this year’s crop loss or whether farmers are waiting for the prices to go up, especially the chol variety (old stock), to touch ₹ 300 per kg from ₹ 275 a kg now. Farmers might also be holding back the chol variety as there is crop loss this year. The arrival of newly harvested produce has also come down. When the disease struck a large tract of plantations in 2013, the government announced a compensation package of ₹ 30 crore for around 25,000 hectares in the district. During the 2007 monsoon, the disease affected crops belonging to about 20,000 farmers, for whom the government subsequently announced a compensation of ₹ 4.59 crore. According to the office of the Deputy Commissioner, the district recorded an average rainfall of 4,582.4 mm till October this year, against normal average of 3,806.2 mm for the first 10 months of the year. During the corresponding period last year, the district received 3,238.8 mm of rain.